Is it truly to much to ask of someone to do their job? I really don’t think so, but then again what do I know? I have really had a week that have tried my patience, and this age old adage too. Somewhere along the line we as a group, society, community call us whatever you want we have lost a large amount of common decency in the way we conduct ourselves. Earlier this week a young gentleman that is employed by my husband chose to quit. I know no harm in that people change jobs every day, that is nothing new. It is the way that he went about it that shows me that the common decency is missing. He quit via a telephone call on Monday night, no 2 week notice, it wasn’t even done face to face. He was supposed to call the owner of the business to tender the resignation, but wasn’t “man” enough to do that either; pure cowardice. What have we taught this generation about how to handle themselves in business? As I have said before I have asthma, fairly severe asthma, the kind that makes my lungs pretty much the focal point of my daily life. Along with my asthma has come eczema in recent years, just the joy, can’t you see me jumping for joy here ( that is dripping with sarcasm.) The eczema causes a pervasive itch, like my body it being over run by ants. I moisturize on a daily basis, multiple times a day and still find myself scratching. The only thing that deals with this itch at night is a medication called Hyroxyzine. It is available by prescription only. This week my auto refill of that prescription had no more refills on it. The pharmacy contacted the doctor and she ignored their repeated requests. I went 3 days without the medication, last night my body went into total itch overload. I itched everywhere, and constantly. Sleep was not an option, after 5 hours of this merciless itching, which I tried to control with Benadryl to no avail. The stress finally took over and next came the migraine, I treated that with Imitrex, Promethazine for nausea and Vicodin for pain. Finally I was knocked out. When I woke up this morning my first call was to the Physicians Office where I met yet another excuse about why my prescription hadn’t been called in. But the staff assured me it would be. I just walked out of the Pharmacy empty handed and made a call to the Physicians Office and reached their after hours staff, because again someone didn’t do their job!!! I just would like someone to explain to me how something can fall through the cracks for 4 days in a row??? 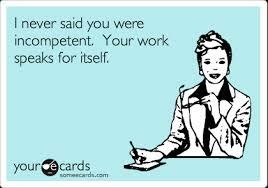 Incompetence seems to be the only word that springs to mind at the current moment. The on call Physician assures me he has called it in now, but why did it take so long, so many calls and so much agony to get people to just do their jobs?? ?